Newish look | What Car? Fact is the 1 Series has been a hit, with more than one million sold worldwide since 2004, and it's the most popular BMW in the UK after the 3 Series. In styling terms the biggest differences are to be found at the front, where a flatter nose includes a kidney grille whose faint reverse rake references BMWs from the 1960s. The subtly muscular billow of bodywork over the back wheels emphasises a rear-wheel-drive layout that remains unique in a class of front-drive cars, its superior handling balance intended to appeal to keener drivers. 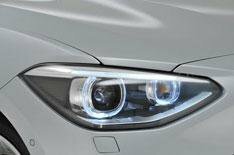 According to Zimmerhackl, this 1 Series should be more rewarding to drive than the outgoing model. His team also targeted a number of other weak spots, top of the list being ride quality the improvements here, assuming they're delivered, will be good news for UK drivers given our battered roads.